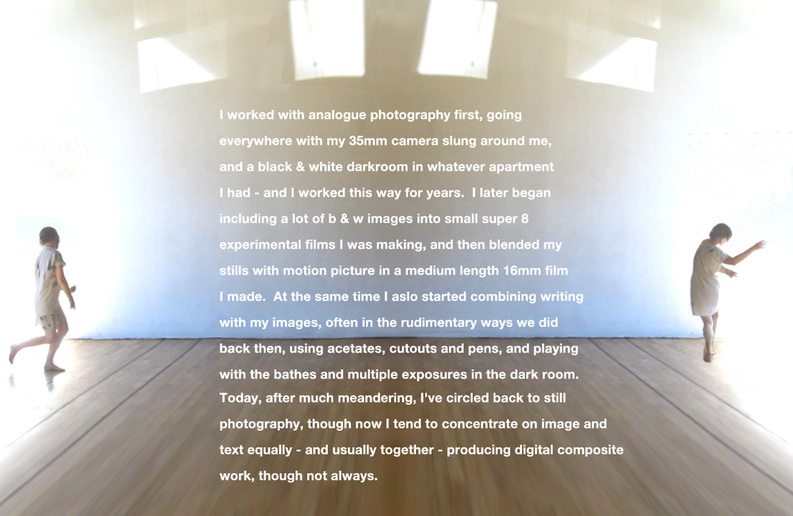 zoetrope is a photo-based project with which, more and more, I look at perception & memory, and what informs one's take on place, self, and the making of meaning. I've long been interested in language, textual and visual - both are natural, intuitive, and instinctual for me. So, what I make, when I do, is what comes to me most often in some form between word and image, untethered, touching, tandem. That's how this happens - hokey as it sounds. I hope you find something that touches you here; you'll draw your own conclusions. That's what I'm endeavouring to do. What else can any of us do? that 16mm film, landing - le film pour Loïc, came out in 1997 and enjoyed some exposure on the independent and art house circuit, and was kindly reviewed in Séquences: la revue de cinéma, no 195, 1998, in a piece about short films and love (flip to p. 11) by Élie Castiel. Slocan Skipping Stones. 8' x 2' photomural. City Panorama public art exhibition project, King County Metro and Photo Center Northwest, Seattle, WA. Installation takes place spring 2016-17 in bus shelters across King County, Washington (my exact location TBC). The mural will be displayed for one year. The project is funded by 4Culture. ​In an in-between time, I had a clothing design company, lib designs, for a few years, and had a store on the edge of Vancouver's Chinatown for a year too. But it was really fun, and I loved it all.